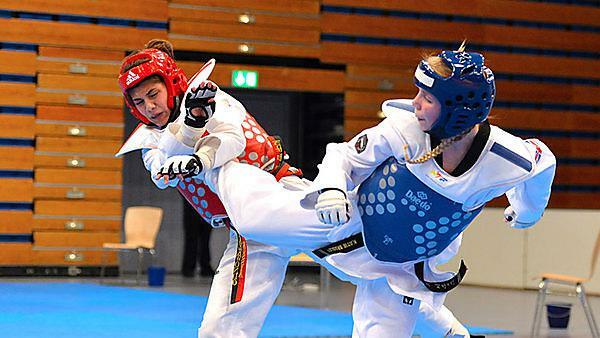 Plymouth University Taekwondo star Katie Bradley has been selected to represent Great Britain under-21s at next month’s European Championships. The 18 year old Mechanical Design and Manufacture student, who is part of the University’s Sporting Excellence Scholarship programme, received the call up to represent her nation in the under 46kg division at the competition in Romania on 19 November. This year is Katie’s first year as a full senior, but the talented student has already represented her country four times. Only last year Katie brought home a World Junior bronze for Great Britain and became Commonwealth Junior Champion in Edinburgh for Team England. Katie moved up to the senior ranks in January this year and has already seen her fair share of success, winning the German Club Championships, Tongeren Open, British International Open and Berlin Open. She also earned a third place bronze at the G1 Spanish Open – which was her first senior podium at a G-class Olympic ranking competition. In addition she put in strong performances against the world number five and world senior bronze medallist, demonstrating she is a force to be reckoned with. For now, the training and preparations continue, including competing at the G1 Croatia Open on 7 November. Plymouth University offers some financial assistance as part of its Sporting Excellence Scholarship but Katie also has to self-fund for the European under-21 Championships, and has set up a CrowdFunder page.